While trekking through London, England back in 2004 I could not wait to start sampling the city’s rich cultural history customs and tradition. I was enthralled by its poised sophistication and charm. Even the solemn quality of Britain's air was enough to make my womanly spirit soar. 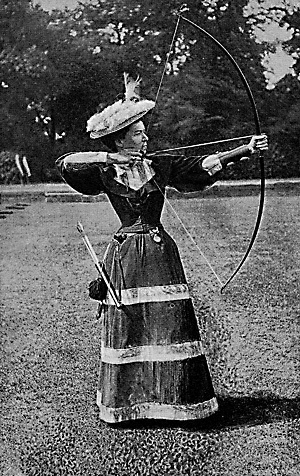 In fact I may have felt a bit like Alice Legh (1855-1948), the greatest British woman archer of all-time; wonderfully strong and empowered. I didn’t feel like giving myself permission to sip tea on the streets of London or devouring a plateful of fish and chips; it was much bigger than that. There was something in me that was reclaiming my inner female warrior, completely free of the way others defined me or the limitations I’ve placed on myself as a woman. I think that Alice Legh too, must have discovered her inner warrior in London particularly when shooting her bow and arrow. Truthfuly, although I could not find much written work on Alice, I did pay close attention to these few images of her which to me, suggest, a desire of women of her time, and mine, to be recognized for something greater than themselves. Many like Alice the archer, became warriors, for the right to prove to men, that they can be more than just stay at home moms, wives and servants. Alice Legh, who was known as Britain’s greatest female archer, was perhaps also a woman of impeccable resilience and spirit. She used her strength of character to further her passion for archery and winning the 1908 national ladies’ championship a total of twenty-three times. She later became a gold medalist, winning against another British archer Sybil Fenton Newall (October 17, 1854-June 24, 1929) as part of London's summer Olympics holding on to the title for several years. Female archers then, and now, are symbolic of what still stands in parallel defiance of all laws and limitations imposed by men, with regards to the female form and her role in society. That is why, I believe that people’s love for archery comes from a primal, instinctual place that has little to do with gender or social convention and everything to do with our shared desire to feel empowered and free. Alice Legh passed away in a nursing home in Stroud, Gloucestershire in 1948.